I love books. And I love to read. In fact, if you give me a good book, I would rather that than a TV pretty much any time. I spend my summers reading in the glow of the sunshine, and my winters curled up under an abundance of blankets and thick socks, staying warm and cozy with my stories. My favorite author is John Grisham and I have read nearly everything he has written. I’m serious. There are three books on his list that aren’t legal thrillers (because (I’ve read them all!) that I haven’t made it through yet; two of them I have, one I’ve made it partially through, and the third one I have had no desire to read, but I probably will. Of course, he did just release a new book, The Reckoning, which I will get my hands on soon and will likely devour quickly. Usually when I have finished his current collection (because I’m always excited when he releases something new), I’ll pick up a handful of books and try and get through them. If I find an author I like, I’ll snag everything I can. Last year it was Suzanne Palmieri and her collection of “The Witch of….” books. But now I’ve finished all of those two and it doesn’t appear she has anything new on the horizon. I’ve been reading a scatter of books by different authors and this summer I found a copy of The Woman in Cabin 10 by Ruth Ware and I have been obsessed ever since. As soon as I was finished, I ran out and bought In A Dark, Dark Wood and could not put it down. What’s funny is that my coworker and my cousin were both reading the same books at the same time. And so now I’ve done a little tradesies and am making my way through a third book of Ware’s, The Death of Mrs. Westaway. These books are so much fun. They are spooky and nail-biting and kinda give one the heebie-jeebies. I’ve been on the edge of my seat reading them and I look forward to reading more. Some parts are a little predictable and I have my nit-picks about her (how many times in one book can someone write “in spite of”?? ), but she is entertaining and keeps me wanting more – just like Grisham. Definitely a sign of a good writer. Who’s your favorite author? Have you read any of Ruth Ware’s books? Did she give you a spook? I recently (last week) finished my 26th John Grisham book. I love him. He is my all-time favorite author and I get so enthralled with his story-telling that once I’m reading one of his books, it’s all I want to do. I’m completely wrapped up in his tales. A few weeks ago I zipped through two of his big hardcovers and when I was finished them both, I realized they were the last of Grisham’s that I had. Ack! I went through the list of books and thought I had read The Broker, but it turns out I had not. So, I put a few people on the lookout for it. Two days later, I went on a Saturday adventure with BFF Spanky to a Community Yard Sale several towns over (one I don’t think I actually knew existed). I told her the name of the book I was looking for, in case we happened to stumble upon a yard with books for sale. The first yard we stopped at, Spanky veered to the right where there was baby gear set up (she nailed herself an outdoor playpen with a cover), and I veered to the left to a few tables set up with boxes on top. Turns out, the boxes were full of books. The very first box I looked in and the very first book I saw was John Grisham’s The Broker. I kid you not. The.very.first.book!! Of course, I grabbed it…and paid my .30 cents and could not have been more elated!! I did not buy another thing that day, I felt complete. Of course, I plowed through that book too (I swear my TV has not been on in weeks!) and when I finished it in nearly record time, I once again felt sad because it was the last John Grisham book in my collection. I picked up an biography and am nearly finished it, and yesterday I stopped at the book store and grabbed two new Grisham books. Ahh, life is good again. 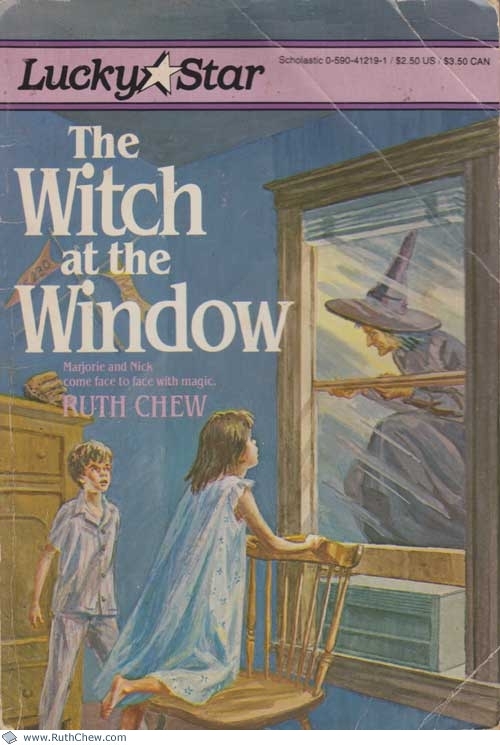 When I was 8 or 9 or 10 I read a book called “The Witch at the Window” by Ruth Chew. As some of you know, I have always loved to read and zipped thru Nancy Drew novels, The Babysitters Club and even Archie Comics….but “The Witch at the Window” is one of those books that has always stuck with me. It was suspenseful and thrilling and entertaining for my young mind. And something about that witch on the cover always freaked me out. In fact, I used to flip the book over so she wasn’t staring at me I couldn’t see her.